Certificate in Agribusiness Management is a program which offers prospective students an opportunity to acquire basic theoretical concepts in Agribusiness field while acquire practical experience as well. It is a 12-months part time programme which will offer specially for students who completed their G.C.E. Advanced Level examination. 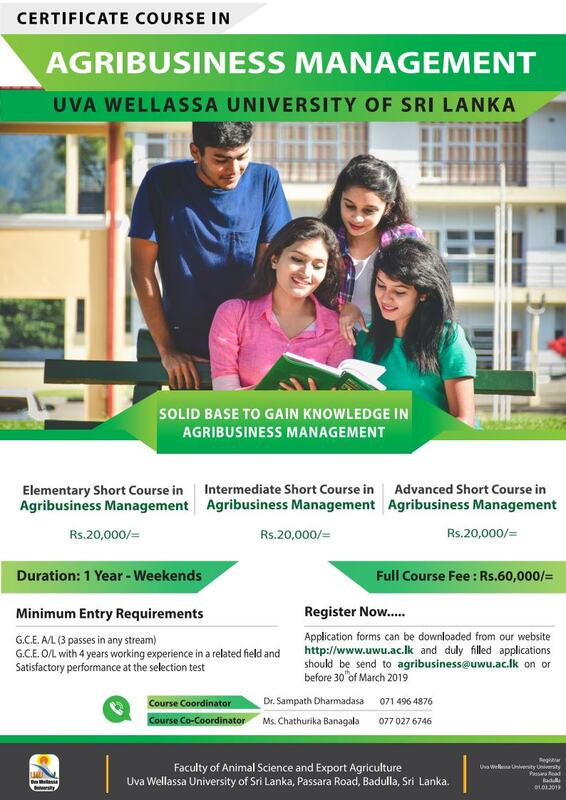 Course consists of three short courses viz Elementary Short Course in Agribusiness Management, Intermediate Short Course in Agribusiness Management and Advanced Short Course in Agribusiness Management. dully filled application can either send to agribusiness@uwu.ac.lk or Director of CODL,Uva Wellassa University,Passara Road, Badulla on or before 31st March 2019.